CHICAGO, Illinois—Even though it wasn’t the official theme of the show, this year’s version of the ProMat trade show presented attendees with a vision of the future. From a keynote that looked into a (figurative) crystal ball to predict upcoming materials handling industry trends to awards that recognized the most cutting-edge and ground-breaking technology, show organizers did everything they could to present attendees with a glimpse of how the industry will evolve in the coming years. For the first time, show organizers ran a competition to award the most innovative products on display. Not only were the exhibitors required to have their products sitting on the show floor, they were required to offer a working demonstration of the equipment. There were two categories: best new product and best existing product. 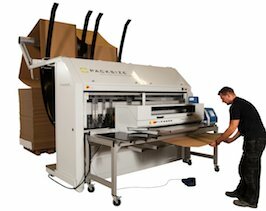 In the existing product category, the Twin Print System from Export, Pennsylvania-based Fox IV Technologies Inc, beat out products from Bishamon Industries, Daifuku Webb, Dematic, Digital Lumens Inc, and Jungheinrich. But it was the category of best new product finalists that drew the most buzz, especially the winner. Finalists included the Dead Man Brake caster from Blickle Casters, Restuff-IT Loaders (adaptable powered conveyor accessories with a worker platform) from Engineered Lifting Systems, the goods-to-person picking solution Perfect Pick from Opex Corp, the Mixed Case Row Palletizing (MXRP) from KUKA Systems and the Pick-to-Light System for Dynamic Pick Face from Intelligrated. The winner was a piece of packaging equipment, the iQ Fusion from Salt Lake City, Utah-based PackSize Limited LLC, that took a piece of cardboard, formed it into a custom-sized, easy-open, no-filler required box, and automatically packaged the item-to-be-shipped into the box, complete with necessary labels. According to PackSize one of the biggest advantages to the system is the reduction in wasted cardboard, a concern that will become of greater importance as companies begin adopting more environmentally-friendly practices and technologies in the future. The custom-built theme was also one that was echoed by one of the show’s keynote speakers. Edie Weiner, president of Weiner, Edrich, Brown Inc, a futurist and change management consulting company, told the gathered crowd that in the next two-to-five years, materials management professionals will need to become familiar with 3D printing. According to Weiner, 3D printing “is going to radically change materials, materials handling, materials storage, and warehousing”. After her presentation, Weiner led a panel discussion featuring George Prest of the Material Handling Industry (formerly MHIA), Rick Blasgen of the CSCMP, Michael Mikitka of WERC and Liz Richards from MHEDA. 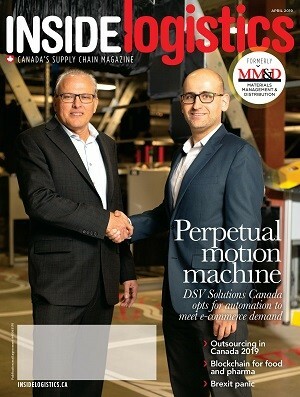 For more coverage from the show, the January-February 2013 print edition of MM&D is coming soon.